Calvin Klein's Shirred Princess Seam Maillot swimsuit was only released this summer, but it's quickly become one of the brand's best sellers. Its name is a bit of a mouthful, but let me break it down for you. Shirring refers to the flattering ruching around the torso, which enhances the bust and hides any flaws. The princess seam part refers to the deep stitching which gives this swimsuit its form-fitting structure. The term maillot might also confuse, but it's just a fancy name for a one-piece swimsuit. Overblown names aside, this is a lovely looking swimsuit from Calvin Klein, or at least it is on the label's model. The reality may not be as glamorous though. Curvy girls are likely to find the bust area lacking, and the leg holes are also a little small. If you're a willowy thing with a long torso this could be your perfect swimsuit, but anyone outside this mold may like to proceed with caution. If you do have Calvin Klein's ideal body shape though, you're likely to appreciate the stylish tank straps and gently padded cups. I love the unexpected pop of this sunset orange shade, but it's also available in an icy aqua hue called glass and basic black. 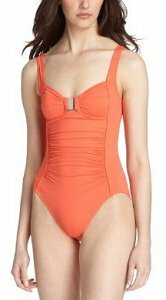 At $98 this is relatively affordable swimsuit by Calvin Klein standards, but I'd make sure of the sizing before I committed to its purchase. The Calvin Klein Shirred Tankini is a two-piece alternative to this maillot swimsuit.